In the Desolate Quadrant, Sam Alexander has battled his way through a series of Nova Guardbots to reach the Black Nova Bunker. As he's fighting them, he contacts Rocket Raccoon to get a status update on a cure for Adomox's poison. On the planet Quainbo, Rocket is hitting a group of doctors who have told him they can't identify the poison. However, the space raccoon tells Sam he has an idea and needs to see a friend. Back in the Desolate Quadrant, Nova has made it to the bunker. However, the door remains locked despite Sam hitting it repeatedly. As he checks the beeping alarm on his phone, he sets his hand on the door. The computer system reads the DNA signature in his hand and confirms he's Jesse Alexander and opens! The hologram informs Sam that his arrival has rebooted the bunker's systems. However, all serums have expired due to a loss of power. Nova requests the machine that can reprogram his helmet. In response, the Nova Prime avatar asks him if he is retiring and should the Nova Corps Service Records be updated. Sam is caught by surprise by the revelation of the records. Later on Oblitus, Sam and Rocket Raccoon arrive with the Nova helmet and a crate. Sam gives the alien casino owner the helmet. However, Adomox refuses to give them the antidote! But when the alien criminal puts on the helmet, his head is instantly engulfed in an energy blast! Sam informs Adomox that he didn't reprogram the helmet following his conversation with Nova Prime. The hologram had shown his the Black Novas service records including the one of his father. 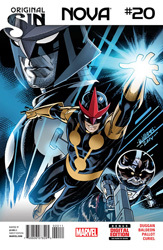 Nova reveals that Jesse Alexander had faked his killing of the Nova Corpsman and Adomox was dishonorably discharged from the Nova Corps for creating the Black Nova helmets. After discovering the Black Novas, the Nova Corps brought them into the Corps as a secret operations division. An angry Adomox fires an energy weapon at Sam which hits his right shoulder. As the casino owner attempts to escape, Sam Alexander picks up a weapon from a fallen guard and fires it at Adomox. The shots miss the alien completely but one blast incinerates a pile of money! Rocket Raccoon compliments Sam on hurting Adomox where it counts. Sam admits it wasn't on purpose and that he was aiming at the criminal. Adomox once again offers to give them the antidote if they lay down their weapons. Knowing that he's lying, Sam hurls Rocket at the founder of the Black Novas! Despite having an angry Rocket Raccoon attached to his head, Adomox refuses to give them the antidote. Sam opens the crate they had brought along to reveal Cosmo! The telepathic canine takes over Adomox's mind and discovers the location of the antidote. Cosmo uses the casino owner's body to operate equipment and bring the cure out of subspace. Nova and Rocket Raccoon quickly inject themselves and are instantly back to normal. Sam is frustrated by all the events of the last few days. However when he looks up at one of the casino monitors, he sees his father! Jesse Alexander is alive but he is a prisoner on Chitauri Prime and being forced to fight gladiatorial games. Adomox states that the transmission isn't live and his father might not be either. Sam punches him to the ground. He also warns the green-skinned criminal that he will be dropping in from time to time to make his life difficult. Rocket mentions he won't be coming back unless it's to kill Adomox. Then Rocket Raccoon demands his money from the casino owner or he'll have Cosmo go back into his head. Adomox pulls out a credit chip and gives it to Rocket. The debt had been for only fifty credits but Rocket mentions that it was his fifty credits. Nova puts on his helmet and heads back to Earth before his planned trip to Chitauri Prime while Rocket and Cosmo launch into space in the Guardian's ship. Meanwhile on Chitauri Prime, Jesse Alexander and a fellow gladiator are preparing to enter the arena together. Jesse confides to him that he still has hope that Sam will rescue him. His alien companion thinks he's a fool for having hope. In the arena, the two warriors begin battling each other to the death.